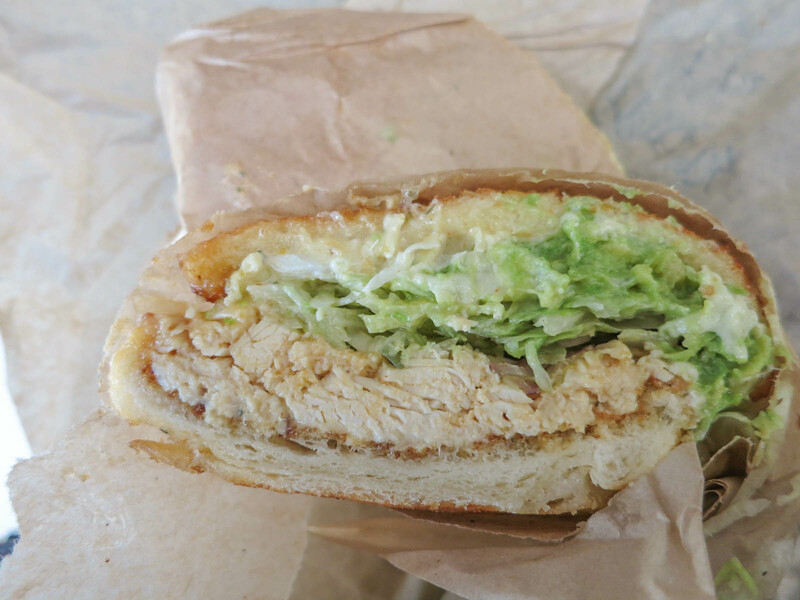 Ike’s Place is a popular sandwich shop in San Francisco. They sell big sub sandwiches with an overwhelmingly large menu of options that range from heaping piles of meat to completely vegan options. They also have a few locations in other places around the Bay Area. My Mom and I visited the location in the Castro district of San Francisco. It is a small store front and they have a bench around the window, but no tables to eat at. Most people were getting them to take and eat elsewhere. 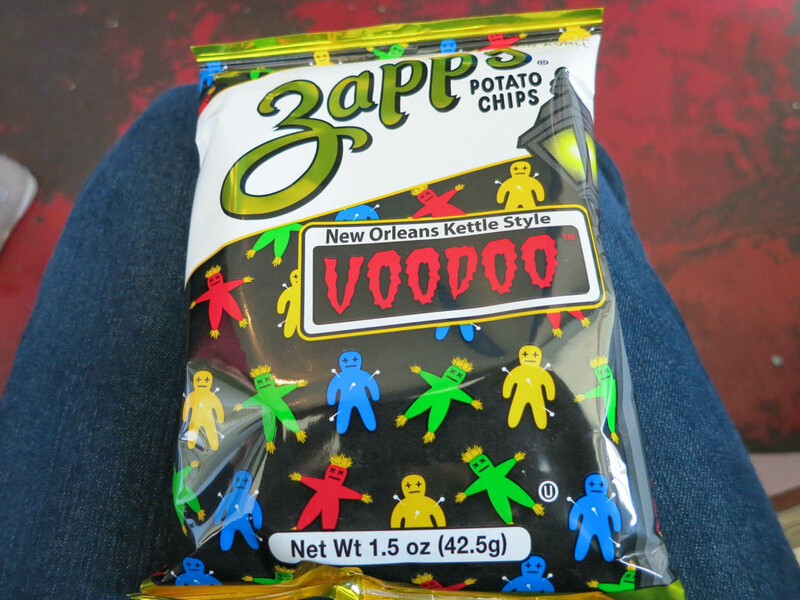 With every sandwich purchase, you get a free bag of Zapp’s chips. I chose the voodoo flavour, which is similar to all-dressed. It is like a combination of salt and vinegar and bbq with a few extra herbs and spices in there. I loved these chips. I liked how they had a balance of sweet, spicy, and tangy flavours. I wish they sold these around Vancouver. I had the We’re Just Friends sandwich (all of their sandwiches have silly names). The sandwich is filled with avocado, halal chicken, honey mustard, and pepper jack cheese (I subbed for vegan cheese). There are generic toppings like lettuce, tomato, and their special sandwich sauce that you can put on any sandwich as well. When I took my first bite of the sandwich, I was blown away. You MUST get the dutch crunch bread if you come here (I don’t even know why they have other options). I wish I had a better picture of it, but the top of the bread has a rough cracked texture from a special rice flour paste that is put on before baking. The result is bread that is soft and fluffy on the inside and really crunchy on the outside. This is the best sandwich bun I have ever had. The inside fillings were also delicious. There was lots of avocado on it, which made everything moist and creamy. The chicken was tender and juicy and all the sauces blended together and tasted great. Be warned though, if you want to take these sandwiches to-go they are pretty messy and they get soggy fast, so I would recommend eating it ASAP. Something to note is that the sandwiches here are massive. If you have a small appetite or aren’t that hungry you could easily split one between two people. Ike’s Place totally lived up to the hype for me and it actually ended up exceeding my expectations. The dutch crunch bread is life changing and it is a filling and affordable meal. A massive, amazing, fresh, sandwich and a bag of chips for $10 is a steal in my books. Yes, for a perfect sandwich.